Beer. Nookie. Roommates. It's another Friday night at Chez Geek, the card game that lets you set up house with your friends - for as long as you can stand them! Get a job; they're all bad. Spend money and your precious spare time to accumulate Slack points. Drink cheap booze, hang out at the cafe, and play with the cats. Do unto your roomies before they do unto you. What other game gives you points for sleeping? Just remember, when your roommates keep you up all night, you can't throw them out. They live here! 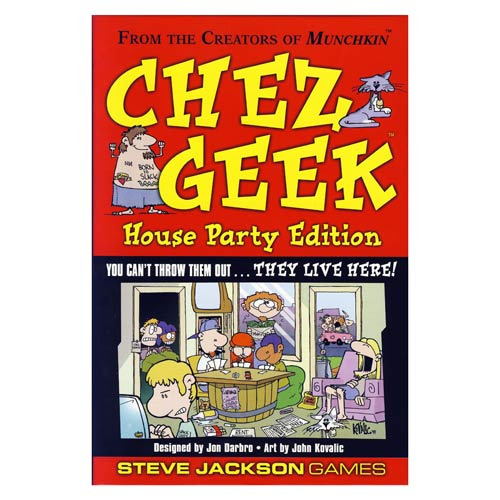 Chez Geek House Party Edition Game includes 224 cards, counters, and a die. 2-5 players. Ages 13 and up.